(This article was written for a Christian magazine, and therefore a Christian audience. But whoever you are, see if this doesn’t sound an alarm that you want or need to hear). It is common, when speaking of fires, to rate them as one alarm, two alarm, three alarm, and so on. Each additional alarm indicates an assessment of the greater severity of the conflagration. Employing this metaphor, I regard Andy Stanley’s April 29, 2018 sermon, “Not Difficult,” to be a five-alarm fire, very serious indeed. His errors would be grave enough in isolation, but in combination, they constitute an inferno that the entire evangelical neighborhood should attend to. I don’t know what you were told when you received your first Bible. . . . You get a Bible, you get to pray the prayer of salvation, and all the parents are like “Sigh. . . Now I just got to teach them to drive.” It’s how Christians think. If that was your experience and you got your first Bible, it didn’t really come with instructions and nobody told you that this big book, probably the biggest book you ever owned, was actually arranged around three different arrangements, or three different covenants. Addressing an audience where many have prior experience with Southern church culture, Stanley portrays that culture as characterized by religious rigmarole, and unprepared children given oppressively large Bibles nobody ever really explains to them. He insinuates that there has been a conspiracy of neglect, as crucial matters of biblical structure and content were wrongly withheld from these innocents, to whom he now presents himself as liberator. 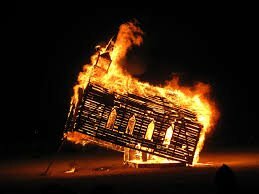 This kind of stage-setting smells of smoke, and with this kind of smokescreen, there is certainly fire. The first alarm. Continuing in his role as putative truth-teller, Stanley elaborates on the formerly hidden secrets he has now come to reveal. So nobody told me that [the Bible] was divided into these three sections that were written to three different audiences within a very, very specific historical context, and that it was sequential, and that there was a story line, but as the story moved along what was important became less important because something more important came along. There were three different groups, there was an individual, that had a big promise, a big covenant was made between God and an individual, and then God made a covenant with a nation, and then God made a covenant with the world, the nations. . . . Abraham was the individual, Israel was the nation, and we’re part of the nations. Even if we accepted his threefold division, is it true that with the coming of God’s covenant(s) with Israel and then the nations, that God’s covenant with Abraham becomes less significant? Does not Abraham become more significant as the biblical record continues, so that Paul will, in writing to Gentiles, insist that Abraham is the father of us all? And was God’s covenant with Abraham ever simply a covenant with an individual, and for his sake alone? Was it not always for the sake of his progeny and for all the families of the earth from the very beginning? And of the time of the end, does not Jesus say “many (from among the nations) will come from east and west and recline at table with Abraham, Isaac, and Jacob in the kingdom of heaven?” Abraham remains an iconic hero to the very end, and a champion of Israel and the nations. Similarly, contrary to Stanley’s construct, with the progress of redemptive history, Israel becomes more important, not less so. Paul, Apostle to the Gentiles, reminds those in Ephesus of their former lost condition as “separated from Christ, alienated from the commonwealth of Israel and strangers to the covenants of promise, having no hope and without God in the world.” For Paul, the Jewish people remain home base for the people of God, not a now eclipsed Plan B with the church being God’s Plan A. The Apostle goes on to remind the Ephesians (and Andy Stanley) that now, through Christ, the Gentiles “are no longer strangers and aliens, but (they) are fellow citizens with the saints and members of the household of God.”  In his argument, who are the saints and members of the household of God with whom the Gentiles are fellow citizens? It is Israel. There is nothing passé about them. Because of his axiomatic supersessionism, Stanley will have none of this. He assures his listeners that Israel supersedes Abraham, and the church supersedes both Abraham and Israel, leaving each with diminished significance. But his construct is easily disproven even from the New Testament that he prefers as alone worthy of being the Christians’ scripture. Today we are going to talk about one of the most overlooked, underplayed, least taught about narratives in the New Testament. And understand this is important language. I said the New Testament; I’m not saying the Bible. I’m talking about this collection of ancient first century documents that got put together later on, and was called the New Testament. And one of those documents is called Acts, A-C-T-S. It was written by Luke . . . and in this explanation of what happened in the early years of the church there’s a meeting, there’s actually a council, a church meeting . . . that is so important because it defines your relationship with the Old Testament. And because that relationship maybe has not been defined or has been for you, it may be one of the things that’s tripped you up in your faith. Reinforcing his frame of himself as liberator, his hearers as victims, and the rest of the church as negligent and oppressive, Stanley mischaracterizes the Jerusalem Council as redefining Gentiles’ relationship to the Old Testament. He misstates the issue in preparation for an argument he will make that the entire Old Testament is to be jettisoned in the name of Christian progress. In a statement that cannot be surpassed for its chilling effect, Stanley misleads by his overstatement, “Peter, James, and Paul elected to unhitch the Christian faith from the Jewish Scriptures.” But surely this is not the outcome of the Jerusalem Council. Richard Bauckham speaks clearly to this issue and summarizes the arguments of Peter, James and Paul. He also demonstrates how James’ argument for the four provisions required of Gentiles in the apostolic decree are founded in Torah, rather than being the occasion for casting it away in celebration of God’s new day, as Stanley would have us believe. The issue is whether Gentile converts must be circumcised and thereby obliged to keep the Law of Moses (15:1, 3), whether, in order to belong to the eschatological people of God, they have to become Jews. . . . Peter argues that the miraculous charismatic phenomena which accompanied the conversion of the first Gentile converts constituted a declaration by God that Gentiles are acceptable to him as Gentiles . . . and Paul and Barnabas support this argument. . . . He [James] argues that the prophets, when they predicted that Gentiles would join the eschatological people of God, also made it clear that they would do so as Gentiles. Contra Stanley, the apostles are not declaring a new day when Torah will be forsaken, however reluctantly. Rather they employ and honor Torah in identifying the communal status of and guidelines for Gentiles whom the prophets and the Holy Spirit have indicated must be fully received as Gentiles. Despite referring to the Old Testament as “this extraordinary book,” Stanley portrays it as another burden from which he is happy to deliver oppressed Gentiles, saying to them, “if you’ve lost or are losing faith because of something that is in or about the Bible . . . especially the Old Testament, I can’t tell you how glad I am that you’re here, because I’m convinced as I’ve talked about throughout this series that perhaps you’ve lost or you are losing faith unnecessarily.” What is unnecessary is the Old Testament, or so Stanley says. In framing his discussion of Acts 15, he reassures his hearers that he is talking about “the New Testament; I’m not saying the Bible. I’m talking about this collection of ancient first century documents that got put together later on, and was called the New Testament.” Stanley will go to great lengths to pit the New Testament against the Old. Because his position is so startling and absolute, I quote extensively below to demonstrate how adamant he is about it. This was new and better. Church leaders unhitched the church from the world view, from the value system, and regulations of the Jewish Scriptures. Not just how a person became a Christian. From the whole worldview. Everything is different. The imperatives, everything is new. Peter, James, etc. detached the church from Judaism. . . . Peter, James, and Paul elected to unhitch the Christian faith from the Jewish Scriptures. We must as well. Because we must not make it difficult for those Gentiles who are turning to God. They didn’t; we shouldn’t either. The faith of the next generation may depend on our getting this. Stanley seems oblivious to how the New Testament quotes the Old nearly nine hundred times. The faith he is peddling bears scant resemblance to the faith once for all delivered to the saints. It pays to think for a moment exactly what kind of faith people can have without the Old Testament. Is anything essential lost from losing the God of Jeremiah, and Isaiah, of the Psalms, and of the Torah? Just where does our concept of the holiness of God come from if our Bible begins at Matthew? And what do we mean by calling Jesus the Messiah without an Old Testament to tell us what the term means? Is this castrated faith worth delivering to the next generation? I urge everyone to listen to Stanley’s sermon and ask and answer this question: What opinion of the Jews and of their religion is he implanting in the minds of his hearers? And how will the Jewish relatives and friends of his listeners characterize Christian opinion of themselves and their religion? Would any self-respecting Jew want to join such a crowd and their Jesus? Furthermore, the Gentile world is broader than the American South. In much of that world, a Bible without the Old Testament is incomprehensible. This is because many two-thirds world cultures are far closer to that of Abraham than they are to Paul’s Roman world. If the Church follows Stanley’s lead, it will find itself without a bridge to the hearts and minds of millions who need to understand and embrace the grace God offers them. All material from Stanley quoted from a personal transcript made while watching Aftermath, Part 3: Not Difficult // Andy Stanley [Video]. Retrieved May 9, 2018 from https://www.youtube.com/watch?v=pShxFTNRCWI&t=351s. Richard Bauckham, “James and the Jerusalem Church,” in The Book of Acts in Its First Century Setting vol. 4: The Book of Acts in Its Palestinian Setting (ed. Bruce w. Winter; Grand Rapids: Eerdmans, 1995:415-480), 452. Rabbi Dauerman – Although I am very new to your blogs and insights, I’d like to weigh in: I feel the scorching heat of the fire! We should all be burning from this theologian-pastor’s shallow, flippant, and misleading interpretation of Paul and the Council of Jerusalem in his sermon. As you say, his “unhitching” comments are extremely disturbing. Stanley says the early church understood their need for “setting aside the Scripture we (Jews) grew up with.” Or similarly: “God’s arrangement with Israel should be eliminated from the equation.” What??? Moreover, the statement, “Jesus wasn’t an AND/Jesus was an INSTEAD OF” is very misleading. In trying to exalt Jesus (Jesus not being an “and”) he denigrates him (he’s an “instead of”. An instead of what? I assume he means “anything Jewish”. That’s very offensive). I believe that Jesus as Messiah is not an “instead of” but a “fulfillment” of God’s promises of the Old Testament, which are God’s spoken promises to his chosen people the Jews. Did Jesus himself not lift up the entire Old Testament saying that “until heaven and earth pass away, not an iota, not a dot, will pass from the Law until all is accomplished” (Matthew 5:18)? Thus these very “oracles of God” which are entrusted to the Jews (Rom.3:2) should never be down played, set aside, etc. and remain in effect as God’s Word until the dawn of the new heavens and new earth. Moreover, Jesus makes his own fulfillment role clearly understood in the statement, “Do not think that I have come to abolish the Law or the Prophets; I have not come to abolish them but to fulfill them” (Matthew 5:17). How could the Christian faith ever be characterized as an “instead of” in regard to the faith of the Jews? Yours is the faith into which we who are gentiles have been graciously “grafted,” the faith of Abraham. I for one am in awe. Moreover, I am in awe of the profound moral teaching found in the Old Testament. To this day, every time I read or study the Old Testament, I am being formed by it — Law, Writings and Prophets — gentile that I am. 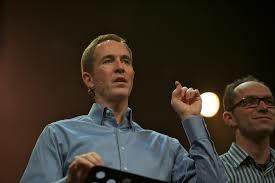 Andy Stanley’s so called “new covenant”, on the other hand, and his cartoonish characterization of the early Jewish Christian movement leaves me with a feeling of dread. THANK YOU Pastor Marzluft for your superlative comments with which I agree 100 percent. I would have written at greater length and also commented on his invidious statements about Jesus being not being an “and” but an “instead of,” but I had to limite myself to 2000 words for submission to the magazine in question. However. 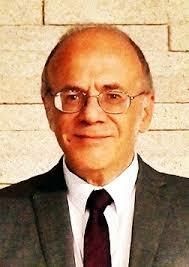 I am happy to say that I have been invited to expand this article for the Kesher Journal, a Messianic Jewish theological organ, and at that time I will be able to deal with the instead of issue as well as his presumption that the New Covenant is with the Church, while somehow forgetting that guy Jeremiah who said is is with the House of Israel and the House of Judah. So now I have more work to do on this piece, which I will do because I promised. And it’s for a good cause. Yes–it’s a red alert, and one has to wonder why the Christian magazine wouldn’t publish it. Glad you will pick up on Jer. 31.31 (perhaps with 1 Cor 11.25) in Kesher. Thanks for writing David Woods. Sadly, Andy Stanley is not alone in his post-Old Testament paradigm of Yeshua-faith. The battle grows wearisome, as most do. Do I understand correctly that the magazine you wrote this for refused to publish it?